I can’t believe it’s been over four months when I last blogged. And if I don’t count the last two posts, it’s been over seven months! I do miss it and have something to say too but I am not thinking of getting back to blogging just now. Actually, I was planning to blog a lot during my 3-month summer break but then I decided I needed a complete break from my online activities for some time. Since starting to work full-time, doing my Master’s and after having spent a considerable amount of time working and learning online for the past three years, I felt physically and mentally tired. So, I took the complete 3 months off which I spent entirely with my family, who hadn’t seen much of me during the last year or so. One task I had originally set myself for the summer break was to move my blog (and other online presences) to one new unified domain. As you can see, Edublogs has added ads to free blogs and disallowed embedding videos and useful widgets (see my Twitter “button” on the right). Also, I have started so many different websites for different projects that it was impossible to keep all of them updated. Yet another reason for wanting to move this blog is that I would like to write about educational topics that are not restricted to Second Life. I’m not sure when I will actually get back to blogging. I might just continue a bit longer with lurking on colleagues blogs and maybe occasionally add comments. The ELT/educators blogosphere has grown considerably and there is a lot of fantastic “stuff” out there that’s worth reading. In activity 9 of this section, we were given a list of tasks to choose from. It is still about identity and appearance. I chose to interview a strange avatar and take pictures of them for a temporary in-world exhibition. I wasn’t sure whether it was about a “strange looking” avatar or a stranger to me, so I found two avatars who are both 🙂 Well, not any more. Blogging about this task is not a requirement but I found what my interviewees had to say so interesting that I asked them for permission to post it on my blog to share this with all of you. I didn’t want to summarize the conversations as I think most of what was said is relevant and I couldn’t possibly say it better than my interviewees. I also didn’t want to take things out of their context. However, I highlighted the bits that are directly related to my assignment and the questions if you want to read only those bits. Many thanks to Exosius Woolley and Schmilsson Nilsson for granting me these interviews and giving me permission to publish them on my blog. Originally, we were told to build a square prim and put a picture of the avatar on one side and a picture of the text on the other. This wouldn’t work with my two interviews, long texts and many pictures. We were then told that we could be creative. So, I build these frames. On the left and right are the chatlogs of the interviews. When clicked, they give the link to the original Google document in case that zooming in to the text and reading it in-world is too difficult. The two frames in the middle contain the pictures. To be able to show several pictures without making them too small or taking up too much exhibition space, I used a picture changer script. Finally, I made an “information cone” with a hovering text that tells visitors whose work this is, gives them instructions and hands out a notecard with a description of the process and a link to my blog post. Building is not yet something that I do very well in SL so building this relatively simple exhibit took me disproportionally long. My rezday is 28 August 2007. 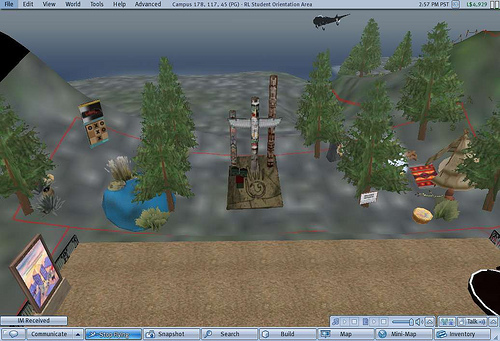 Nergiz signed up for SL and created me because she was curious about how educators were using it. I have to say I looked horrible at the beginning because Nergiz was determined not to spend any money on my looks and outfit. She didn’t know how to make clothes for me, either. I had to walk around like one of those newbies for quite some time. I was so ashamed of myself. I could feel that Nergiz wasn’t very impressed by SL at the beginning and she didn’t feel any relation to me. I am glad she didn’t know how to make snapshots at that time so there are no pictures of my pitiful state. Then, finally, she met some generous people who gave her some free items for me, clothes, headscarves and even a new shape and skin. Now I looked a bit nicer and could even change my outfit now and then. My looks were more coherent and I resembled Nergiz a bit and she started to like me. We made some more friends and socialised. I quite liked that but Nergiz’ motivation was to find out how to teach languages here. So, we went on a search for educators and educational places. It wasn’t easy but slowly we were getting more connected. Nergiz and I learned a lot during these days, weeks and months. She found more friends who gave her more freebie clothing for me and then she “earned” her first Linden dollars and we went shopping for the first time. It wasn’t easy to find something modest so she bought me a traditional Turkish outfit and even a Kimono (for free). Well, it wasn’t our style but it did fit in SL. After a while, we learned how we could modify some of the outfit we had found and I think i look quite all right now. Nergiz wants me to look similar to her, dress modestly and look friendly. She also wants me not to look too serious but also not too flippant. She doesn’t like formal outfit in RL and thinks it creates distance, which she doesn’t want between our students, colleagues and ourselves. By now, we had met colleagues of Nergiz’ and formed a group for language teachers. Since then, we’ve been meeting every Friday. I even got my own classroom and house, which makes me feel more like a real SL resident. 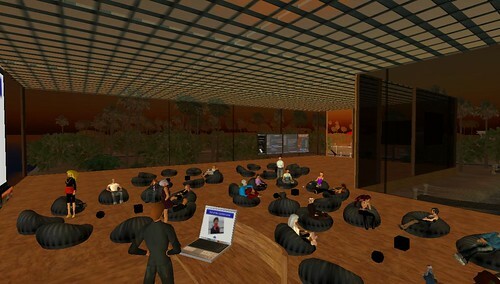 We do socialize quite a bit in Second Life and have made many new friends. Finally, last summer, we felt ready to offer our first English course. It was so much work and we were excited but it was also a lot of fun, too. We and our students liked it a lot. I am happy because Nergiz has decided to keep me and continue teaching in SL and she can relate much more to me by now. That’s why she has filled in my profile and told people who we are with links to her Real Life activities. I’ve tried to record the sound but couldn’t do so unfortunately. Anna and Jaime have recorded it on video. I’m curious to see them and if they publish it, I will embed them here. For now, enjoy the pictures and visit Boracay if you want to play the drums yourself. Complies with the list of principles for an effective design of an orientation session. 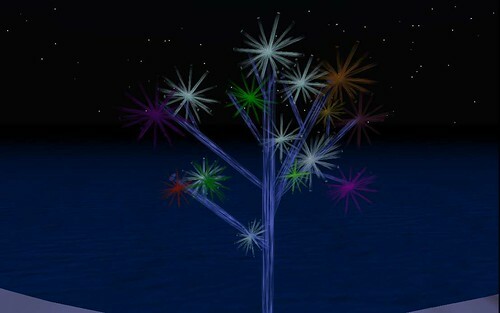 I have decided to create activities for this module because I have seen in several tutorials that camera controls are one of the most important and most-used features of Second Life. I can only agree with this from my own experience and that of my students. As some MUVEnation participants have pointed out when comparing orientation stations, this should even be one of the very first skills that are taught because seeing the screens and pictureboards used to explain SL features require this skills the way the are set up. I have come up with some ideas to practise zooming and panning. Due to time constraints, I will not be able to fully develop all the steps and create picture boards with the necessary instructions. I will also abstain from describing the instructions I would give. First of all, flying would not be allowed for any of the following activities. After looking at a pictureboard with instructions on how to zoom to get a closer look, they have to stand on the hot spot and zoom in on an object, picture or board with a text and either read or describe it. How long does it take until a newbie learns how to see their own face? Here, they will be instructed on how to do that and then have to practise it and take a portait snapshot of themselves. 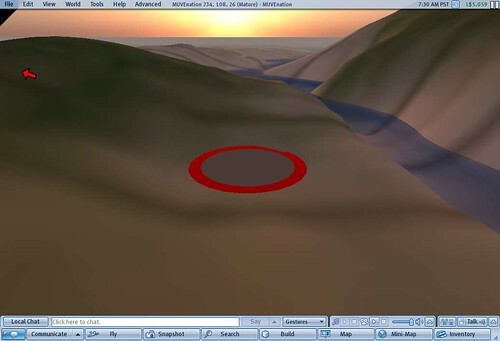 To practise zooming in on a moving object or avatar, they will be instructed to ALT+click on that object or an avatar and follow where it is going and describe what they are seeing or take snapshots and post to flickr. This is best done in an area where there are walls or hills to prevent seeing the moving avatar directly. The hot spot marks the area where a box is hidden underground. Avatars would be told that there is a box. 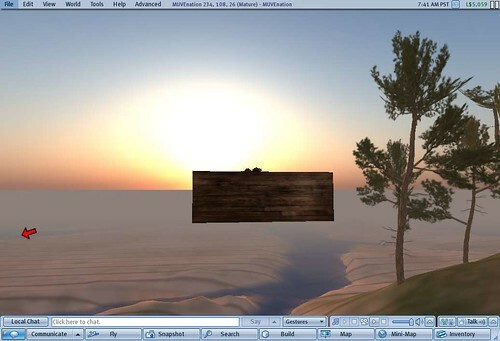 Using camera controls or keyboard shortcuts (which would be shown and explained first on a board) the avatar has to pan to find the box and retrieve its content as proof of completion. If they already have the skills to take snapshots, they will be asked to wear the item they have found as proof and take a snapshot of themselves and post it to Flickr. Now, they would be instructed to pan upwards until they find the box in the air. Find what is on top of the box and, depending on the skills they already have, either take a copy of the item and wear it, take a snapshot or both. If any of the MUVEnation newbies wants to test these ideas, let me know. How was the work with the GKCx? The GKCx is very comprehensive but I had to read through the modules carefully several times to understand the steps. It was too detailed for me. It’s a lot of text. What challenges do you foresee? These activities are very easy to set up and even mobile. Where ever we have the right to rez objects, we can quickly set up the hot spot, boxes and pictureboards. Teachers with minimum experience in building can set it up easly. There is no need for scripting knowledge. For newbies: hand coordination? Mixing up and forgetting when to use which shortcut. But learning and practisng this is the whole purpose of the activity. 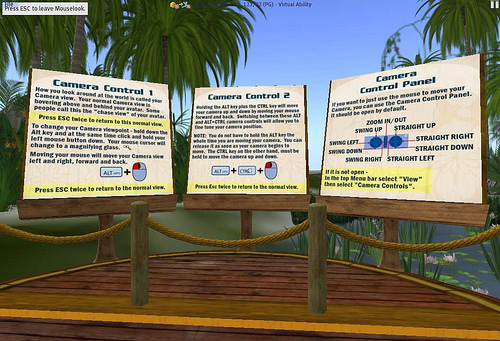 Most orientation stations in Second Life are “traditional” – picture boards with screenshots and text explanations. They might look time-efficient but they don’t offer any interactivity so that new users can immediately try out what they are reading. I believe in learning by doing in order for new information to really become practical knowledge. This is why I have looked at two orientation stations that have a different more interactive and playful approach. This is a very small orientation station set in a forest. 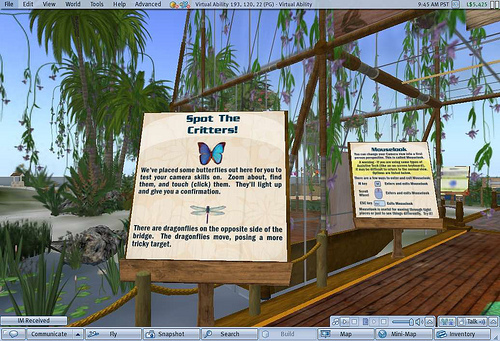 On arrival, the avatar has to click on the sign attached to a tree to receive a notecard with instructions and some initial tips. 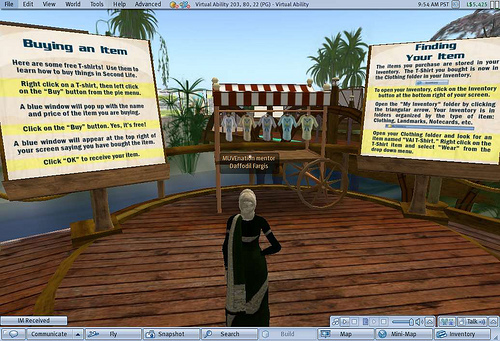 Avatars can practise the most basic skills like camera and movement control, flying, manipulationg objects, using the pie menu, offering friendship, using IM, teleporting and buying. 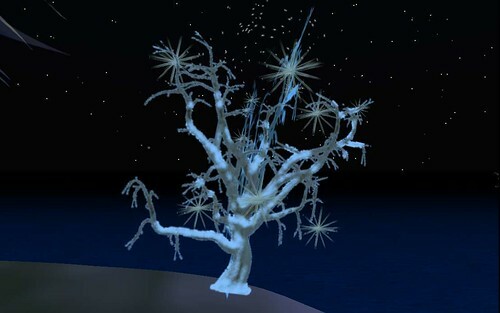 In order to learn these skills, avatars have to complete small tasks like “count the fish in the pond by using camera controls” “use build tools to move pieces in place (to build a totem), “teleport to a location, buy a freebie, come back and unpack it”. The skills that are practised are essential and well-chosen and the tasks are fun, especially when done with a partner or a small team. I did some of the tasks with a colleague of mine who still considers herself a newbie. We laughed a lot while doing some of the tasks but she was often confused and didn’t understand the instructions. Even I was confused at times what we were supposed to. We both concluded that it is not so much an orientation station but rather a further pracice station where students can be sent to after having learned the basics at an orientation station station. It is not appropriate for complete newbies because it doesn’t explain or show “how to” do things but rather “what to do”. So, students are either expected to find out “how to” by trial and error, which can be a good learning experience, especially if done in a team, but also frustrating if there is nobody to help when students get stuck. I assume that originally there was someone to guide students in doing these tasks. This is a very friendly-looking Orientation Centre build for people with disabilities and chronic illnesses to help them learn SL skills. It offers comprehensive step-by-step tutorials which are presented in a very clear way, with additional tips in a different colour. The path is highlighted by large blue arrows drawn on the ground. No way you can get lost here. At the beginning, the information is presented on signs like on most other islands but very friendly looking signs. Practise using camera controls: Finding, zooming in and clicking on butterflies. Visual and auditory confirmation. At the end of the tour, you can click on a mail box to receive a feedback form. This shows they want to keep in touch, serve the community and improve things. Having said that, it seems to be outdated. There is a separate area for advanced tutorials. – Mac specific notes (first O. island that I see this). Besides offering clear instructions and congratulating one now and then, it is such a lovely place that I was happy to stay there and try out everything even though my intention wasn’t learning anymore. And as we know, a good atmosphere and nice surroundings can lower the affective filter which is very important for learning to take place. Both places I have visited were empty except for one friend who I had asked to come along and another MUVEnation participant, doing her homework. Therefore, it is a good idea to go with at least one other person to the Orientation Islands. Besides being more fun, students can immediately practise skills like sending IMs or invitations to teleport. Interesting for me is, how I identified with my avatar from the start and wanted it to represent me and had chosen a name related to my real life name. That was why I was really unhappy about what “I” looked like. I am also a very visual person and learner and trained and worked as a photographer so visuals are important to me. I like to figure out things on my own and had been using all kinds computer software and the Internet for quite some time plus I found the Orientation Island and the people I met there boring. I was also extremely curious about the places in SL. So, I ventured into my new Second Life skipping most of the tutorials. Only later did I realise that this had not been a good idea. There was just too much to learn and the trial and error approach was taking too long. I have to say, I was rather disappointed because of the poor graphics, the empty places and the steep learning curve. I had also no idea how to find those educational places. Most places I managed to find were deserted. The first conversations I had with “residents” were also not very promising. It took a couple of months for me to give it another try. I learned how to move around watching some Second Life tutorials. And after attending a live guided demonstration during a six-week EVO BAW08 course, I finally started to understand its significance for education. I was intrigued by the possibilities it offered for distance and language learning. I started to collect teaching tools and to learn more basic SL skills. An online teacher friend from Mexico, Maru suggested to meet once a week to learn and share our experiences. This was a great motivator for me. Shortly afterwards, we were joined by Alicia, a teacher friend from Uruguay. As I mentioned in my blog post above, having a group to learn together with was extremely motivating for me. Now, I was eager to learn more in order to have something to share with the others. I attended many events, conferences, talks and workshops, met many interesting people and had a growing list of friends that I could ask for help or simply socialise with. 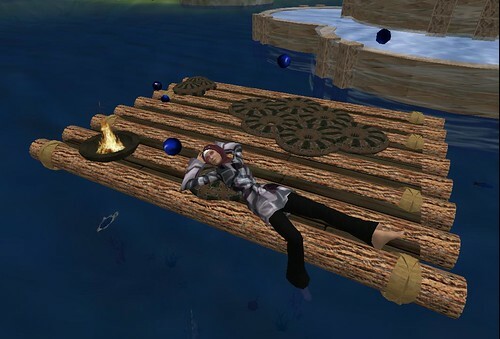 Thinking back to my experience, the frustration and loneliness I felt and the hours spent on searching places of interest, I always accompany my friends that I introduce to Second Life right from the signing-up process to the first hour in SL. I help them through Orientation Island, show them other OI they can go to when they want to learn a news skill and we go shopping for the first freebies. Of course, they add me as a friend, and I explain how they can contact me in-world to ask for help. I think one important step forward are specialised sign-up pages and Orientation stations for specific groups like ISTE for teachers, preferably staffed with life tutors or guides. 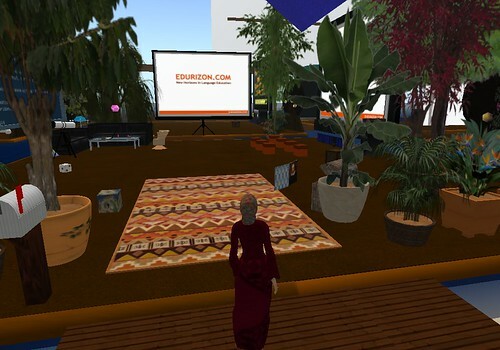 When I recommend SL to educators or business people, I do not give them the general secondlife.com link but the one for educators and business people where there are more appropriate pictures and descriptions of SL..
A side note: While doing this MUVEnation task, I learned how to send snapshots from SL directly to flickr . It’s been only ten days into the MUVEnation course but a community is forming and Moodle and Pbwiki are buzzing with activity. More than double the intended number of participants have been accepted but the coordinators expect a lot of lurkers, participants who enrolled but do not want or cannot participate fully but will rather observe from the sidelines and maybe participate in the forums, now and then. 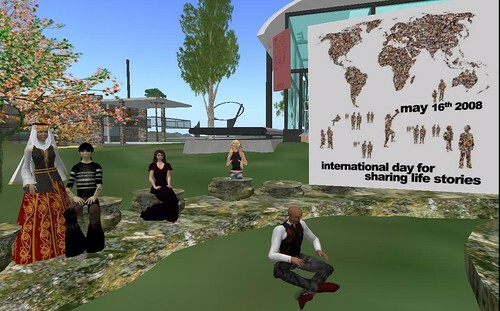 The course is about virtual worlds but we will be using many different Web 2.0 tools for collaboration (Moodle, wiki, Second Life), communication (Moodle, wiki, Twitter, Second Life group notices/IM) and aggregation (Netvibes, Flickr, Twitter, muvenation blog). I am very happy that I have used all of these tools at some point and use many of them regularly. 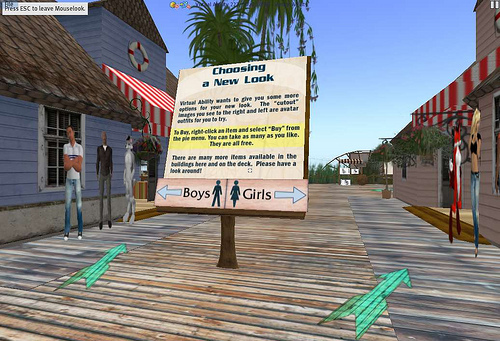 If not, I would feel completely overwhelmed by having to learn how to use Second Life plus all these tools. I believe this is the case for many participants and I can just imagine how they must be feeling at the moment. But, I know from my own experience when I started learning about web 2.0 tools during the EVO 2008 session “Becoming a Webhead” that things will fall into their place slowly. As this is about peer-to-pear teaching, volunteers are needed to help with the various tasks. By volunteering to help feed all the participants’ blogs to the MUVEnation Twitter account, I had the change to use Twitterfeed for the first time and learned how to use it. So, already in pre-week 1, I learned how to use a new tool and I got to know many of the participants through the introductions and interactions in the Moodle forum.